Everytime I create a cake I want it to be different than my last one, probably because I want to try out all that I see in blogosphere as well as have some new content to post here. A friend asked me to teach her cake decoration last week, so to help her out I guided her in making and decorating this cake. It had to be different cake to give an opportunity to present it here to you guys. I have taken permission from her to post it. I kept the cake simple but decided to have ombre effect in layers with layers of chocolate, coffee and vanilla cakes. Since she suggested using coffee flavour, I infused sugar syrup also with coffee by adding instant coffee powder while boiling water and sugar for syrup. I have been meaning to use my newly acquired Wilton 1M tip which V had been very kind to bring from US. I can’t tell you how many people I requested to bring it earlier but finally V did for me. I actually left him little choice in the matter by ordering it from here and getting it delivered at his office address. So having whipped ganache roses on top was a no-brainer. This is what I ordered 1M tip for and ofcourse the swirls. Watch this space for some swirl cupcakes soon!! The cake was most divine and from V to kids to friend’s family, all couldn’t have enough of this cake. I prefer my cakes to be more moist so generously soak them in syrup and that is what makes them rich and moist when finally served. Go make this cake and satisfy that chocolate and coffee craving. Increase the quantity of coffee in both the syrup and cake based on your preference. If you want more pronounced flavor of coffee then use coffee or mocha whipped cream instead of ganache as chocolate frosting subdued the subtle flavour which I incorporated inside the cake. 1. Bake one chocolate cake as per instructions given in the recipe. Bake a second layer of coffee cake where I used the recipe of vanilla cake and added 2 teaspoons of coffee powder while mixing wet ingredients. Bake a third layer of vanilla cake. 2. Prepare sugar syrup and add 2 teaspoons of instant coffee powder while boiling water and sugar. I prepared double the quantity of chocolate ganache as I wanted to pipe roses using 1M tip, so I knew it would eat up a lot of ganache or any frosting. 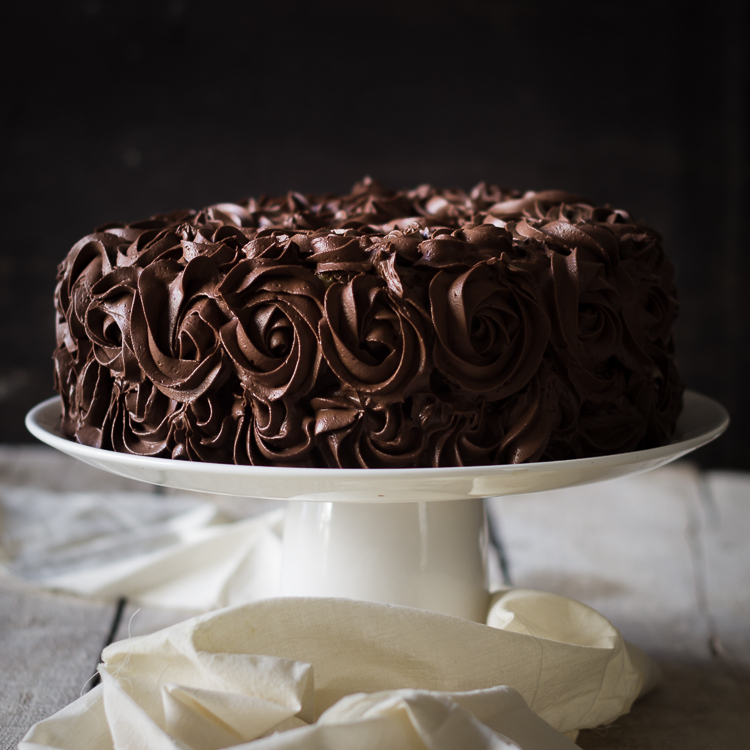 Refrigerate ganache for at least 2 hours so that it is easily whipped. Remove from refrigerator and whip for 4-5 minutes. 3. Place the chocolate layer on a platter or cake stand. Make some holes into the bottom layer using a fork. Soak the bottom layer in coffee syrup. Then lightly spread whipped ganache. Place the coffee layer on top of the chocolate layer & repeat the process of soaking & spreading filling. Finally place the vanilla layer & again soak it. Lightly spread ganache on top & sides of the cake making a crumb coat. Refrigerate the cake for 1 hour. 4. Remove from refrigerator and pipe roses to your heart's content using 1M tip. Chill and serve. And enjoy the accolades.